Biology is the most inexhaustible storehouse knowledge. The fundamental characteristic of biology is its possibility of unlimited growth since nature is an inexhaustible knowledge to the learners. As such there is infinite scope of boarding one's horizon of knowledge...it has exposed to mankind infinite avenues of knowledge in nature, living and non – living, the world beyond human perception thereby makes us conscious of the unknown to be explored. It develops insights with the mysteries of creation and existence, which have always attracted the attention of man since the dawn of civilization. According to Keats "truth is beauty "so we can say that biology is a subject, which has aesthetic value, and this aesthetic sense is to develop I the students. Biology gives opportunities for creative thinking and constructive, imagination .This brings about behavioral changes in the learner, and enriches has made a tremendous impact on the cultural life of the present people. Truth goodness and beauty are the three vital necessities of a morally high person these qualities are seen in scientists and students of biology. So we can say that biology develops moral values in the students. Study of biology develops the will to know facts, sprit of enquiry and judgment above prejudice. Moreover study of this subject develops not only high regard for truth but also the search for our environment. By this biology gratifies and quenches the thirst of our knowledge and makes us intellectually valuable. The knowledge of biology helps to solve the various problems regarding pollution growth ecological imbalances bioengineering of biology etc. It is necessary to have some elementary knowledge of biology for becoming a useful member of a community and apply it to the daily life. Here, Biology students are prepared vocationally and become useful members of society. In the present setup, the teacher is the pilot in every schemes of work the success or failure of a biology course depends on the teacher. Biology departments provides scientific knowledge, professional training, new technique of teaching, methods of evaluation, improvisation of science apparatus ,equipments, science kit, club activities, able to operate OHP, LCD projectors etc. to meet the challenges in education. Total area of the lab is 30'.0''*43'.3'', 1299 Sq.feet. Impressed & Appreciated by NCTE members. Glass articles, conical flasks, test tubes, apparatus, LCD Computer etc., are in our lab. Teaching aids and other learning materials prepared by the staff & students are displayed. Practice in using audio visual materials. Utilizing leisure time for self learning. Organising guest lectures and Organizing Workshop for the student-teachers. Conducting demonstration classes, discussion ,student seminar through Ppt , debates, symposium on the various topics of the school syllabus. Conducting Science practicals from 9th std to 12th std syllabus. On 20th Jan 2012, Extension Service Department of Biological Science conducted a one day workshop on " Value added and effective teaching in biological science ". On 21st December 2011 Extension Service Department conducted one day training programme on " EQUIP YOUR SELF IN LANGUAGE " .Mr.Subramanian was the Resource Person and trained the participants. 2010-2011 – N. Visalakshi Awarded Ist rank in Biological Science. 2010-2011 – Out of 8 Optional subject, highest mark in Optional I (Biological Science). 2009–2010 – D. Asha Deva kumari Awarded Ist rank in Environmental Education (Elective paper). 2008–2009 – V.S. Jayasree Awarded Ist rank in Core paper –I, Optional I & II (Bioscience & Bioscience). 2008–2009 – V. Tamilselvi Awarded Ist rank in Core paper –II (Psychology). 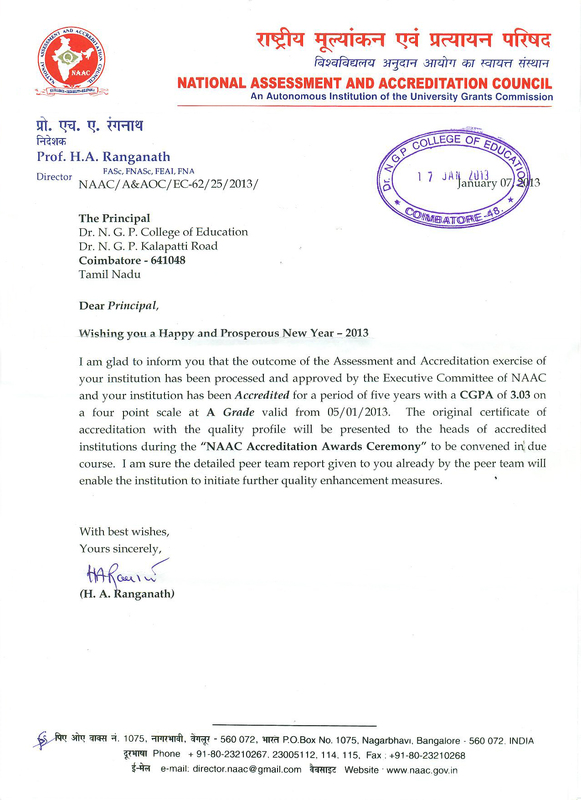 2008–2009 – S. Hemalatha Awarded Ist rank in Core paper –I (Education in Emerging Indian Society). 2007–2008 – University IXth rank & college Vth rank. 2007–2008 – P. Mallika, N. Nithyananthi, S. Sudha, & S. Rajendiran secured Ist rank in Biological science paper. 2007–2008 – Cash award for all. 2006–2007 – V. Shyamala Awarded Ist rank in core Paper I & Biological Science paper. 2006–2007 – Cash award for all. 2006–2007 – V.Shyamala Awarded University IIIrd rank. 2005–2006 – J. Kavitha Awarded Ist Rank in psychology (core paper II).